OXFORD, Miss. – Organizers of an online crowdfunding campaign want to supplement medicine with music for young patients being treated at Blair E. Batson Children’s Hospital at the University of Mississippi Medical Center in Jackson. Members of the Columns Society, a group of UM students who serve as the university’s official hosts and hostesses, have created an Ignite Ole Miss campaign, hoping to raise $1,400 to cover the cost of Rhythm Pax gifts for children undergoing treatment at Batson. A Rhythm Pax is a canvas sack filled with age-appropriate percussion instruments and other music-related items. The proposed gifts include a kalimba, a thumb piano; sound shapes; rain sticks; bells; triangles; hand bells; a Blue Man Group/”Stomp” DVD; finger drum; an iTunes gift card; and more. “The therapeutic benefits provided by music are endless and allow families to cope and be together while creating and enjoying the gift of music,” said Ingrid Valbuena Alcina, philanthropy chair of the Columns Society and a senior majoring in integrated marketing communications. Though acknowledging the role of music in addressing illness is not new, recent research is illuminating how music affects the brain and other body systems in a measurable way. Using that knowledge, practitioners can now integrate music with medicine to augment healing. Leading the research in this area is the Johns Hopkins Center for Music and Medicine in Baltimore. “It’s fascinating and powerful to think that music, something that has been floating around in our environment forever – that this natural, omnipresent human activity has demonstrable benefit as treatment,” said Sara Hoover, the center’s co-director. Batson Children’s Hospital is the only medical facility in Mississippi devoted exclusively to the care and treatment of sick and injured children and adolescents. The hospital averages 9,000 admissions a year and nearly 80,000 children are treated in its clinics and emergency room annually. Patients come from all of Mississippi’s 82 counties to receive comprehensive medical care for everything from common childhood illnesses to serious trauma and life-threatening or chronic illnesses. Batson Hospital provides care in more than 30 specialty areas, including newborn medicine, pediatric cardiology, neurology and surgery. 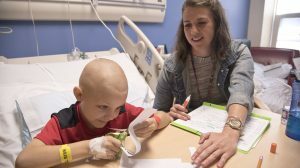 It houses the state’s only pediatric intensive care unit and emergency department along with Mississippi’s only pediatric treatment programs for cancer, cystic fibrosis, sickle cell anemia, congenital heart defects and more. Ground has been broken on a $180 million new pediatrics tower adjacent to Batson Children’s Hospital, further expanding top-tier medical care for Mississippi’s youngest citizens. To join the Columns Society’s effort to provide Rhythm Pax to hospitalized children, click here to visit the campaign’s Ignite Ole Miss page.